The CIU-4 coupler interface unit supplies the necessary supply voltage, cable, and connector required to use the CAU or SU3/4/6/or 7 telephone couplers with the EC-2010, FA-2010, or D series dialers. It allows dry battery (18VDC) operation of the telephone dialer. Each CIU-4 kit includes one 5' 6-conductor connection cable with 15-pin plug and 5 6" leads with crimped-on Y connectors, 3" square x 1 1/4" deep dual 9-volt battery holder with dual 3/8" high mounting posts with screws, 3-screw terminal bus, and dual connection leads (5" and 7 1/2"), and product/installation sheet (batteries are not included). The battery module mounts in the dialer case. No line voltage is required. The coupler is powered only when the dialer is activated. 6VDC @ 20mA power draw during operation. 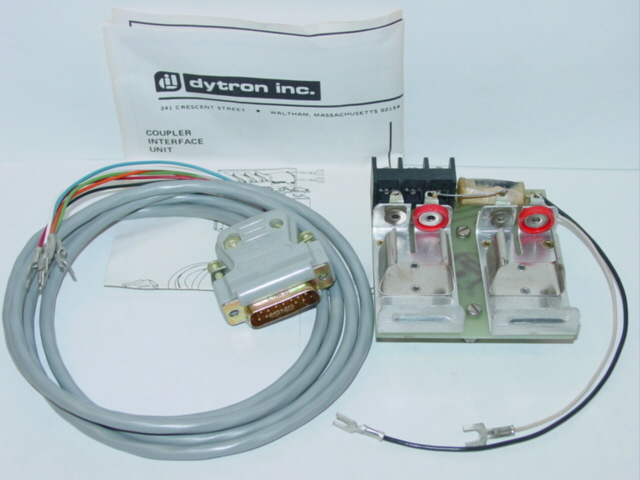 Unused in the original Dytron product box.